Sunday evening's double bill at UCLA's Archive Treasures: 50th Anniversary Celebration started off with the two-strip Technicolor charmer FOLLOW THRU (1930). 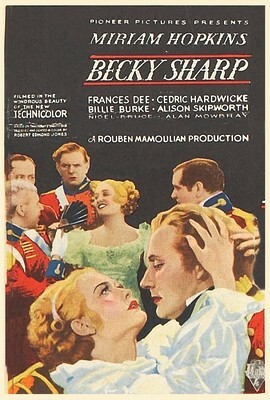 The evening's second movie, BECKY SHARP (1935), is historically significant as it was the first feature-length three-strip Technicolor film. After the movie's initial release, it was only available in two-color Cinecolor, which did not represent how the film looked in Technicolor. The UCLA website has a video showing how the color looked before and after UCLA's restoration work. Ironically, I unexpectedly found the two-color FOLLOW THRU, with its vibrant oranges and greens, even more beautiful than BECKY SHARP, though BECKY was lovely and I was glad to finally see it. BECKY SHARP is based on a play by Langdon Mitchell which adapted the famous novel VANITY FAIR by William Makepeace Thackeray. The screenplay was by Francis Edwards Faragoh. 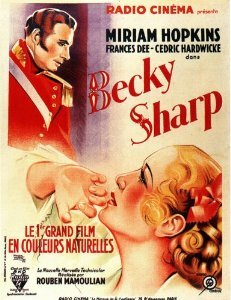 BECKY SHARP was directed by Rouben Mamoulian, who later made two especially beautiful Technicolor films, BLOOD AND SAND (1941) and SUMMER HOLIDAY (1948). 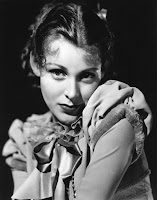 Ray Rennahan, who filmed BECKY SHARP, would win one of his two Oscars for BLOOD AND SAND. His other Oscar was for a little movie called GONE WITH THE WIND (1939). It's been many years since I read VANITY FAIR and I can't say I remember it very well, so I'm uncertain just how much of the story the 84-minute movie used, but by all accounts the plot was trimmed down considerably. It's rather interesting in that Becky (Miriam Hopkins), the title character, is not at all a heroine; I suppose she could be called an anti-hero, but I'm not even sure about that. Any sympathy I had as a viewer was reserved for sweet but dumb Amelia Sedley (Frances Dee, below left), who extends her friendship to Becky long past the time she should have called it quits. As the film begins, Becky and Amelia are leaving a girls' school, where Becky was a (resentful) charity pupil who assisted in teaching. Becky initially tries to convince Amelia's kind buffoon of a brother (Nigel Bruce) to marry her, but he's not going to marry beneath his station, so off Becky goes to be a governess to the Crawley family. Becky eventually marries Rawdon Crawley (Alan Mowbray), a soldier, but they're dirt poor and tend not to pay their bills. One of Becky's solutions to keep them afloat financially is to become mistress to the Marquis of Steyne (Cedric Hardwicke). And so it goes, on and on, as Becky is constantly looking for another mark willing to hand over some money. While one might feel sympathy for a tough heroine fighting for survival like, say, GONE WITH THE WIND's Scarlett O'Hara, Becky is just crass and mercenary, a nasty person who's in it for Number One. She'll walk on anyone who gets in her way. The most entertaining aspect of Hopkins' performance is seeing the lightning-fast way Becky changes personas, as situations demand. As a side note, I felt that the characters of grasping Becky and long-suffering Amelia, who meet as schoolgirls, seem to rather anticipate Margaret Lockwood and Phyllis Calvert in the Gainsborough film THE MAN IN GREY (1943). The most striking sequence in BECKY SHARP is a beautiful set piece set at a dance as in the distance Napoleon is heard advancing on Waterloo. The dancing mixed with the sound of cannons firing in the background is quite memorable. Future First Lady Pat Nixon is an extra in this sequence. The film is worth seeing as a novelty, both in terms of the story and the film's great visual look, and fans of the lead actresses will want to watch it as well. That said, the unpleasant lead character and story, however well acted, mean it's probably not a film I'll be anxious to revisit, at least any time soon. The cast also includes Billie Burke, Alison Skipworth, G.P. Huntley, and William Stack. 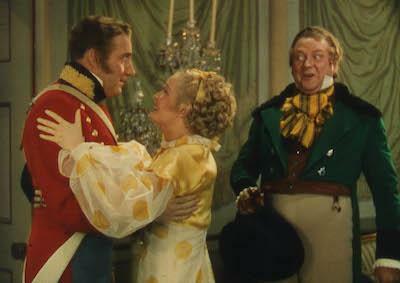 BECKY SHARP has fallen into the public domain and terrible prints abound on YouTube and DVD. It can also be streamed on Amazon. The print to see is the UCLA restoration but to my knowledge that version is not available on DVD. Coming soon: Reviews of two more films from the Palm Springs Classic Science Fiction Festival, THE THING FROM ANOTHER WORLD (1951) and THEM! (1954).